University City Wine Fest – the best tasting festival in town! 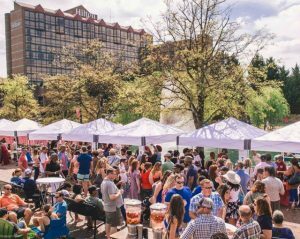 Join us April 13 for Charlotte’s most spirit-filled springtime festival – the University City Wine Fest. Spend the afternoon lakeside at University Place sampling and learning about fine wines from two dozen wineries, plus craft beers and spirits! One ticket covers all the beverages you can consume (responsibly) at our event. The third annual Wine Fest is better and BIGGER than ever – in fact, three days bigger! “We’ve seen an increase in interest and attendance for the University City Wine Fest each year and are thrilled to grow the festival from a one to four-day event,” says Darlene Heater, Executive Director of University City Partners. Saturday’s signature Wine Fest will give guests the rare opportunity to choose from among more than 100 wines from 25 wineries. Tim Wallace of the Wine Vault once again has selected the wines for the event. Many of the people pouring the wines will be able to talk knowledgeably about both the wineries and the specific wines. Besides the bountiful wine, guests will also be able to enjoy craft beers and spirits, live music and interactive entertainment. University Place restaurants will be open for your dining enjoyment, too. Your ticket will cover all the beverages you can consume (responsibly) at our event. General admission: Enjoy the festival from 2 to 6 pm for $35. Early Entry: Enjoy the festival from 1 to 6 pm for $40. Grab your wine palate, invite your friends, get tickets and enjoy! Taste, Sip & Stroll the night away! Get a great start to Wine Fest weekend. Join us lakeside on the University Place boardwalk on April 11 for Taste, Sip & Stroll – a night of tasty restaurant bites, classy wine, crafty brews, lively local arts and the uniquely Carolinas Alternative rock music of Swim in the Wild. Fine wines are meant to be enjoyed with great meals. That’s why we proudly introduce the first annual Wine Fest Evening Dinner, Friday, April 12, at University Place. The menu for this special night has been crafted by Executive Chef Eric Litaker of Suffolk Punch Culinary Café and Taphouse. The wine pairings for our dinner are sure to delight, as well. Famous Toastery at University Place will roll out the reds and whites carpet on April 14 for the Wine Fest Sunday Brunch. Enjoy all of the Toastery breakfast and lunch classics plus several red and white wines, Mimosas and other adult specialty drinks. No event ticket is required. Just order off of the Toastery menu, and enjoy! Famous Toastery at the Shoppes at University Place is located lakeside next to the main bridge, at 8933 J.M. Keynes Drive, Suite 2. The official Wine Fest Sunday Brunch hours are from 11 am to 2 pm. By the way, Famous Toastery at University Place is open 7 am-3 pm daily. You can order alcoholic beverages beginning at 10 am on Sundays, too. All four events are within a five-minute walk of the JW Clay Blvd LYNX light-rail station. Trains run every 15 minutes or more frequently daily until after midnight. If you haven’t ridden the LYNX before, you’ll enjoy the comfort, convenience and safety. First-time rider tips for riding the LYNX.